YOU DO NOT BUY A PROPERTY ABROAD EVERY DAY, SO IT IS ADVISED TO WORK WITH A PROFESSIONAL COMPANY THAT CAN ASSIST YOU WITH ALL THE NECESSARY STEPS DURING THIS PROCESS. IMMO ABROAD IS SPECIALISED IN BUYING, SELLING AND RENTING PROPERTIES ABROAD, AND THEREFORE YOUR IDEAL PARTNER. Once you have decided to look for a suitable property in your favourite region you will soon notice that the offer is large, but that prices can sometimes show inexplicable differences. This can have many causes, such as the type of land on which the house is built, the specific requirements from the local government, and whether the plot has a municipal zoning plan or a rural zoning plan. This can vary per country and per region. How many meters can be built, and how many m2 are built? In short, a long list of questions that can greatly affect the price and the value of your potential new property. 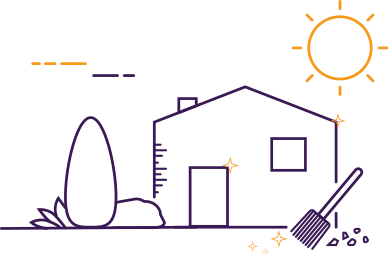 We advise all our customers when buying a property to have prior research conducted by a lawyer with knowledge of the local area; they can easily contact the local authorities. In all cases it is wise to have your own lawyer who checks for you if all documents are in order, if there is nothing illegally built, the number of square meters which are built with regards to the ownership documents and many other things. If you cannot find your ideal property within our organisation’s offering, but would like to use our expertise as purchase counseling we offer that possibility as well. Our brokers and our in house lawyers can be of excellent assistance and, if desired, can also do the negotiation on your behalf. This has the advantage that they do not see through rose coloured spectacles so they can look at the property in a more neutral way. With over 15 years of experience our team knows the pros and cons of buying in the region, and can often avoid costly mistakes. Calculate your budget taking into account additional costs such as transfer taxes, notary fees and any mortgage costs. Search our site for the offer that appeals to you in the desired region, and contact the manager responsible for these objects. They can often answer the first questions. Make an appointment to visit the desired properties. If the visited properties are not quite to your liking, make your requirements clearly known to the agent on the basis of the properties you just visited, so he can search specifically for you. We list many new properties per week in our database, so visit our website regularly. Every country has it’s specific requirements. Before you make a purchase in Spain for instance, you will need a NIE tax number, which is a number the notary uses to transfer the property to your name, and allows you after purchasing your house to connect utilities such as water, electricity and gas as well as to pay the real estate taxes. We will inform you what steps you should take in each country before and after the purchase, and will assist you with these steps as well. Most likely you will also need or want a local bank account; our organisation works closely with several local banks that focus on foreign account holders. We will put you in direct contact with the bank manager, which can open the account for you and can advise which type of account best suits your needs. Please pay special attention to the bank’s charges, that can differ drastically with those in your home country. Paying attention to this before opening an account can save you a significant amount over time. In recent years it was almost impossible to get a mortgage for a second home, this was due to the crisis and the decline in the value of real estate that came with it. Banks could not precisely estimate future real estate values, and thus the value of their collateral. The result was that they did not provide mortgages to avoid any risk. This situation has changed and banks are now more willing to provide mortgages. If you fulfil certain conditions it is possible to get a mortgage. As a general rule of thumb, you can borrow up to 70% of the value of the property on condition that the monthly charges do not exceed 40% of your net income after deduction of your other obligations. Upon your request we can put you in contact with various banks, without any obligations, that can make you an offer for a mortgage. 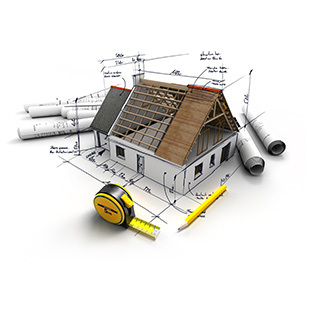 Prior to making a purchase, you can decide to do an architectural survey. This study may be limited to the advice of our architectural surveyor, but can also be carried out by an architectural engineer who will issue a written report on the state of the object. In many countries you may need a energy certificate, which will have to be made before the transfer. This will then also be discussed in the report. Once there is agreement on the purchase price, the work can begin on the transfer. Take the additional costs into account, and make sure you know how high these costs will be before you decide to buy. The bank may charge a fee when taking out a mortgage. The main costs relate to transfer taxes, notary fees and any mortgage costs. In most countries and regions the seller pays the agency brokerage fee. 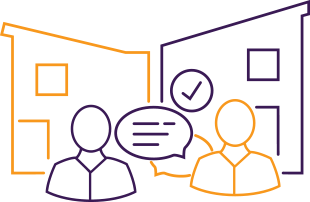 Our tax advisor can tell you exactly in accordance with the broker which costs must be taken into account. In certain countries it is advised to make a division in price between the real estate property and any furniture that you are going to take over; this can make a saving on the taxes. Sales in most European countries are made using the Euro currency; if you do not come from a country that uses the Euro as its currency, you will probably have to change. We advise you to contact a professional company specialised in exchanging currency. This can lead to substantial savings compared to the rate you can get from your own bank. 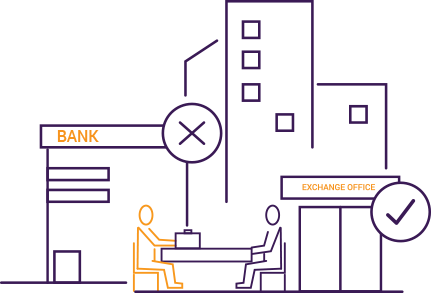 We can put you in touch with accredited exchange companies, which can quote you their rate so you can check whether these companies can offer you a better condition than your own bank. We only put you in touch with companies with a proven track record, based on previous transactions from our customers that were very satisfied. The exchange rate may vary at anytime and with each company, so we advise you to contact at least two exchange offices to request the rates. 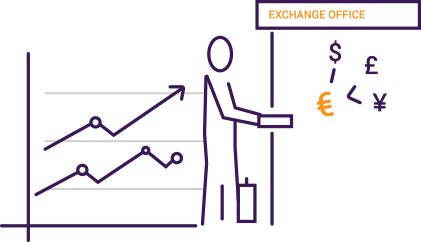 Ask our consultant to put you in contact with reliable exchange companies, so that they can quote you their best rate. Once your newly bought property is registered in your name you still have a few things that should be taken care of, such as having water, electricity, gas, municipal charges and taxes transferred to your name. We will gladly assist you with these formalities and advise you after purchase. You may have plans for your new property such as remodelling, redecorating, construction or modifications, like adding a swimming pool. Note that a cheap buying price can turn out to be expensive, especially abroad where architectural matters and appointments can often go wrong. We advise you to discuss your requirements with our advisor. If you are handy and want to do a lot of things yourself, then he can certainly give you some tips, and if not put you in contact with local construction companies that have a proven track record.